One of the largest electricity distributors in Brazil, Brazil Elektro, has awarded Globalsat Group, the first Pan American satellite telecommunications services company, with an award that highlights its strategic importance as a partner who has evolved to meet Elektro's growing and sophisticated communications on the move needs (COTM). Iberdrola-controlled Elektro distributes power to 228 cities across one of the region's most challenging territories. This involves 112 thousand kilometers of distribution networks operating in an area of 121 thousand square kilometers, including both heavily and sparsely populated areas. Throughout this territory, the company is in charge of 1.7 million poles and 140 substations, and critical to its mission is a fleet of over a thousand vehicles. Many of these vehicles need 24x7 communications regardless of weather or circumstances, which is why Elektro counts on Globalsat for mobile L-band satellite service. 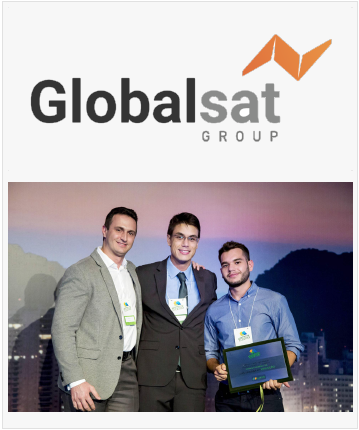 Igor Falcao, head of Globalsat do Brasil and Senior Vice President of Sales - Latin America of Globalsat Group, commented that they are delighted and proud of this distinction. Working with Elektro has been a complex undertaking and has required that they maximize efforts across their local and international organizational structure from the get-go. The importance of power cannot be overstated, it's as mission-critical as it gets and they have been able to deliver and maintain high availability mobile satellite PTT communications at an unprecedented scale in the region. This has allowed Elektro to minimize costs and maximize uptime through the constant and optimal availability of their distribution network servicing fleet. At the heart of the mission critical PTT solution that Globalsat Group provides for Elektro there is an intelligent PTT (Push to Talk) terminal, which makes efficient use of L-Band and terrestrial cellular services simultaneously, providing low cost voice connectivity when cellular is available and seamlessly switching to satellite service when or where cellular is not available due to geographic conditions or any other circumstance, including network congestion or failure due to natural disasters. Distributed annually, the Elektro Supplier Award recognizes and disseminates the best practices of suppliers of materials and services, encouraging the continuous improvement of their processes, not only to meet the requirements of contracting services or supply of materials but also to promote total alignment with the Elektro mission.